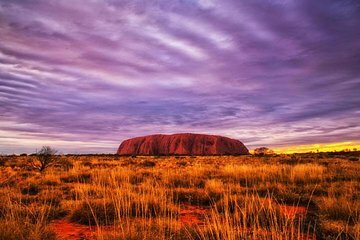 Disfrute de las sensacionales vistas de Uluru, Kata Tjuta y Kings Canyon en esta excursión de 4 días por el misterioso Centro Rojo de Australia. Regresa a la naturaleza mientras acampas bajo las estrellas del desierto; caminata alrededor de Kata Tjuta y Kings Canyon; y ver el amanecer y el atardecer sobre el sagrado Uluru. Eso no es todo: descubrir el rico patrimonio aborigen de la región; Pruebe la comida o la etiqueta tradicional de la fogata australiana en un emocionante paseo en camello, en vuelo en helicóptero o en quad (se aplican costos adicionales). Este tour es apto solo para pasajeros de 18 a 49 años. Acampa en el desierto y sumérgete en la comida de la fogata australiana. Tour perfecto para los visitantes por primera vez. The Uluru rock, Kata Tjuta and King Canyon are amazing things to visit, out of this planet. To sleep under the stars in the desert close to the campfire while our amazing tour guide was singing and playing her guitar or playing music on her speaker, was magic. I have to highlight her passion and enthusiasm for guiding us during these four days.A bad point for me was the poor cleaning conditions of the kitchens, the use of chemical dish-washing liquid that contaminates this sacred land and they should use also biodegradable rubbish bags, for the same reason.Be prepared to do a lot of work, it is not a resting trip...but it is once in life and full of adventure. Whole experience was great. Tour guide amazing energy, knowledge and total enthusiasm. Highly recommend this tour to anyone looking for something different. Enjoy the rustic authenticity of the outback. Just an amazing tour. This tour was absolutely magnificent from start to finish. Tahnee was such an amazing guide—great at making all the different personalities in the group feel at ease and enjoy their time—and extremely knowledgeable as well. The Red Center was spectacular, as was sleeping under the Outback stars! It was a fantastic tour with a wonderful guide who worked very hard for us. I had lotsa fun exploring the sacred place and meeting new people in the tour. It would have been awesome if the tour is a little flexible and accommodated our request to visit the Field of Lights. Great camping trip and our Tour guide Daria was great. It was a very fun tour! Fun Dale the tour guide, fun mates, and fun activities. Not to mentioned the early morning wake up time. But it was so fun! A fun way to enjoy the authentic outback experience. This tour was fantastic. Good meals that everyone helped to make. Dale, our tour guide, was excellent, very knowledgeable and has a great sense of humor. The hikes were hard, but well worth the views they came with. The nighttime views of the stars were great and the swag is rather nicer than a tent. Note: Don't be dumb like me, and place your swag on an ant hole. That will not end well for you or the ants. Our tourist guide Chris was amazing, ful of knowledge, fun,... This was incredible adventure with great group of people. And of course, all "rocks" are spectacular.